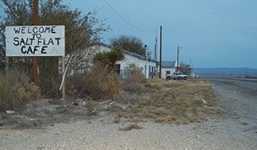 Salt Flat, West Texas ghost town. 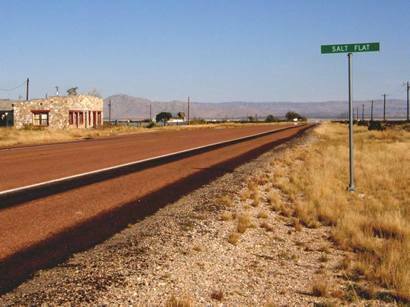 Although the major events occurred just East of El Paso at San Elizario, the salt lakes here were the cause of the much written about San Elizario Salt War. It's an interesting chapter of Texas history and is usually included in most books written about the Texas Rangers. 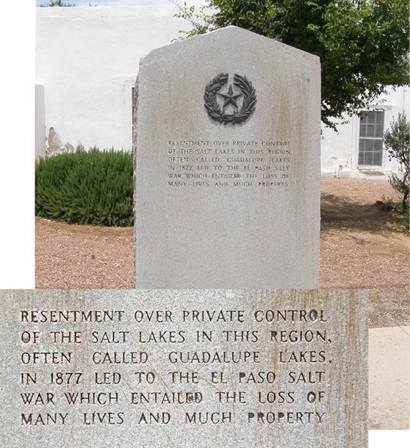 You can check the Handbook of Texas Online under "Salt War of San Elizario" for the details, but in a nutshell it was a non-family feud that came about when a claim for title was sought for the flats which was thought by many (including the rival faction) to be public property. 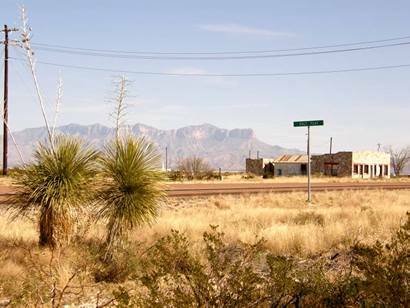 During its seven-year simmer, the "war" claimed fewer than a dozen lives, but since it involved factions on both sides of the border and the Texas Rangers as well as the Army, it demands its place as a (rather large) footnote to El Pasoan and West Texas History. 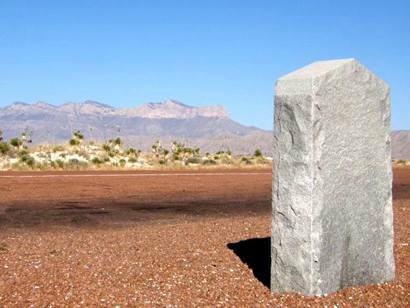 Because of the Salt War Fort Bliss was reestablished later the same year it had been abandoned (1877). 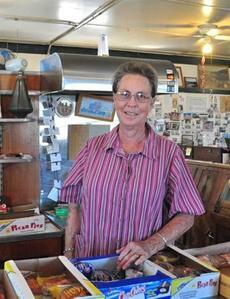 The physical town of Salt Flat can be traced back to a vegetable farmer who sold produce in Van Horn. J.W. Hammack was his name and he was employed at nearby ranches just after the turn of the (19th) century. 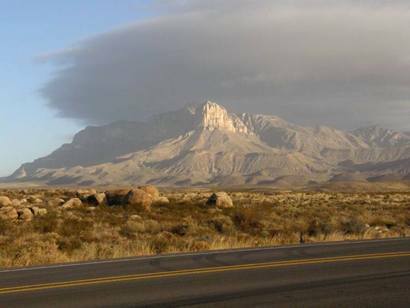 He raised a family here and in 1928 his son got wind of a planned highway connecting El Paso with Carlsbad, New Mexico. 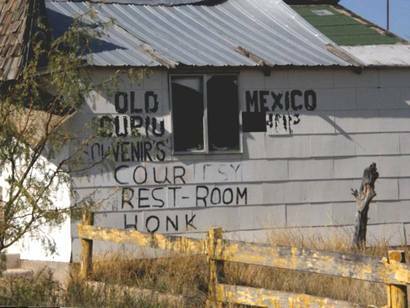 This valuable information was gotten from the highway surveyors according to T. Lindsey Baker's Ghost Towns of Texas. 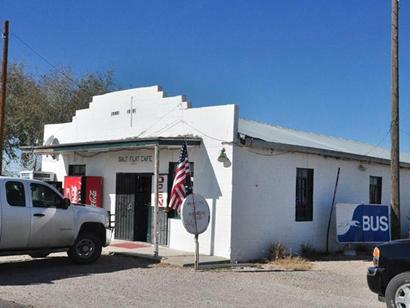 A store and gas station were potential gold mines and Hammack had the location. 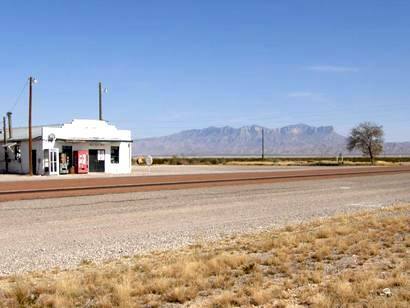 Almost immediately competition arrived and Salt Flat soon had 2 stores and 2 gas stations. 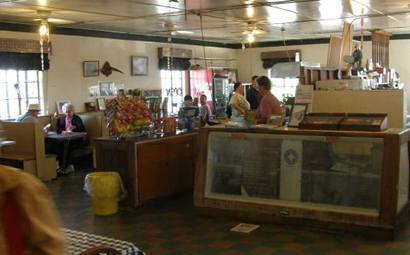 Both store owners opened cafes and then "Tourist Courts," which were the forerunners of motels. 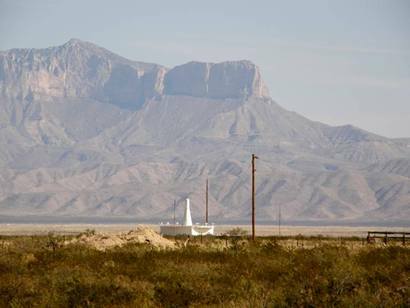 Flying over the Guadalupe Mountains was difficult before aircraft cabins were pressurized. 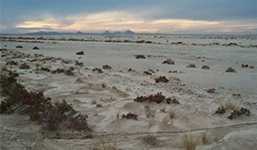 An early passenger airplane crash in 1932 prompted the government to create an emergency landing field at Salt Flat. FFA personnel manned the field 24 hours a day until technological advances made it obsolete in the 1960s. 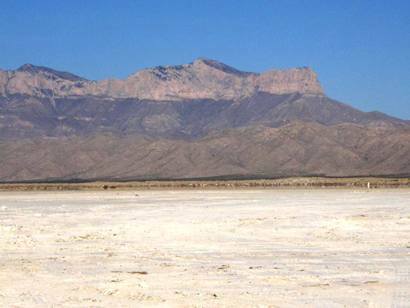 The salt came from shallow lakes that formed after rains in the Guadalupe Mountains. 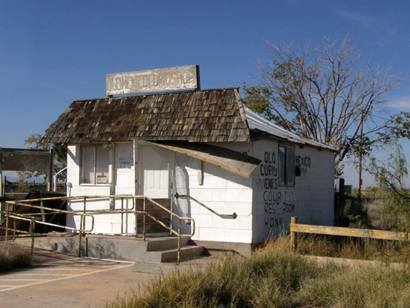 It was "mined" for cattle as late as the 1930s, but wells drilled in Dell City lowered the water table to where there was less and less salt deposited. 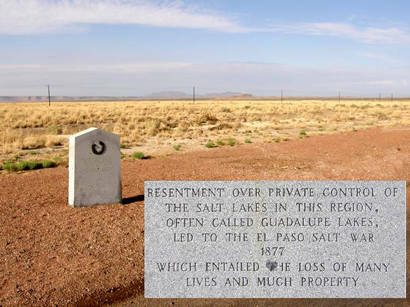 Resentment over private control of the salt lakes in this region, often called Guadalupe Lakes, led to the El Paso Salt War 1877 which entailed the loss of many lives and much property. "We still have bus service"
"We are still cooking good meals"
"We still offer the same friendly service that my Grandparents and Parents offered..."
"The many many pictures of the history my family left me." 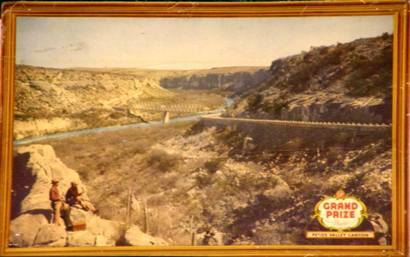 "Pecos Valley Canyon print ad hanging in the cafe, showing the old Pecos River Bridge on US 90 northwest of Del Rio." 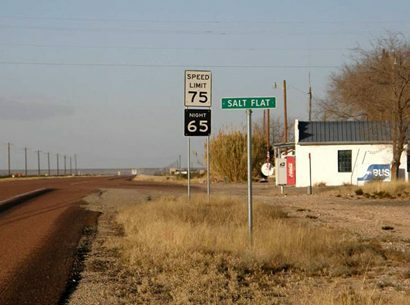 I am a near-native of Salt Flat Texas. 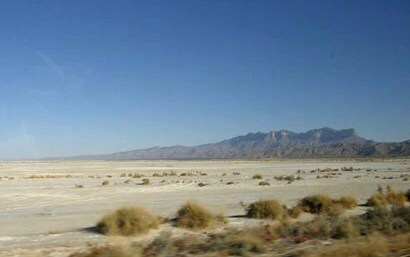 Though I was born in El Paso, my mother was from Salt Flat. 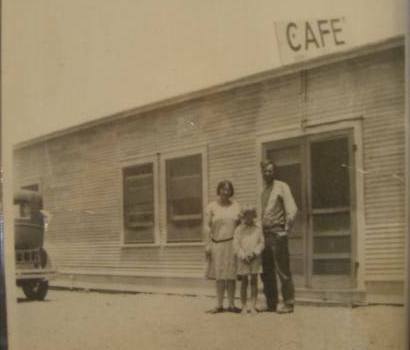 My grandparents, Clyde and Catherine Grable, owned the "second" cafe in Salt Flat. I remember it well, as we lived there for a number of years and spent many vacations there. 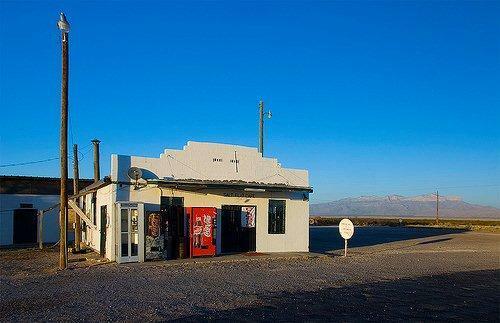 It was a wonderful place for a boy to live, full of hot sun, thunderstorms, horned toads, bats (lived in the garage), snakes and other desert dwellers. As a teenager spending the summer, walks across the desert with a 4/10 shotgun in hand was heaven. There are many adventures that occurred naturally there that now, seems more adventurous than the urbanized/civilized man I've become. My parents are both alive, though my grandparents have passed on. 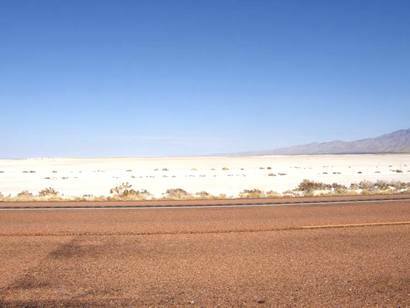 Eighteen years ago I visited Salt Flat, many years after my grandfather sold it. Nothing remained that I remembered and the only thing remarkable was the amount of grass visible, nurtured from the sand by a rare rainy season. 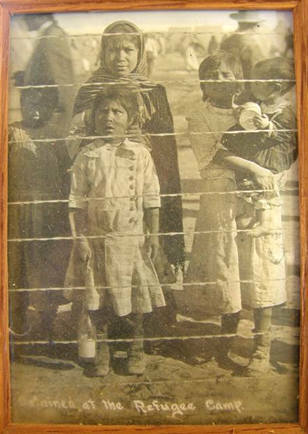 Though I would like to hear from others who might remember my family, I'm not sure any survive. There are many stories, names and events I know we could hash over. 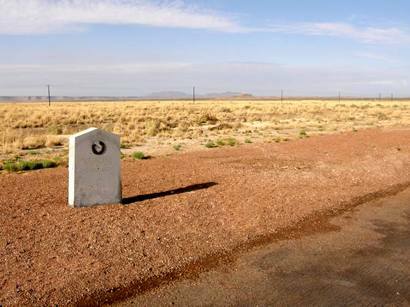 Perhaps, if anyone remains, we could talk about going to the movie in Dell City, or "headlighting" jackrabbits on the airstrip or back highway to Dell City, or picnics at McKittrick Canyon or visits to Ma and Pa Glovers at Nickel Creek. I know my mother was glad to leave there, but I wish it was a place to which I could return. I may be the only person alive today that helped clear the first rangeland near the location where Dell City is today. 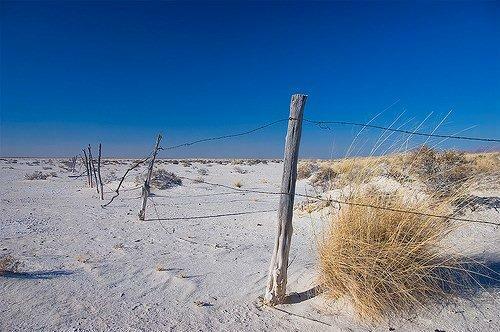 In 1946 a group of Lynn county farmers went to Salt Flats to grub out the Mesquite trees and turn this ranch land into farming land. Thad Smith and his brother Ores Smith. Thad Smith owned the Hd 14 Alas Chambers Crawler that the grubbing ploy was mounted on. The two drivers of this rig were Harley Smith, and JB Williams. Harley and JB were brother in laws, Vera Harley's wife also lived at the camp or near by, they slept in their 40 model Ford. Camp was a little shotgun one room house that most of us slept and eat in, everyone had his army cot and a change of clothes. 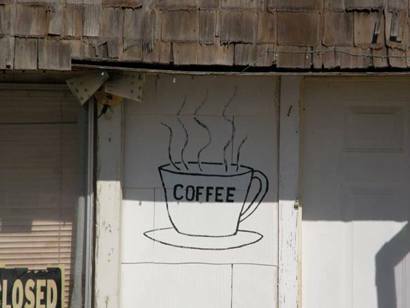 I remember the old Cafe. 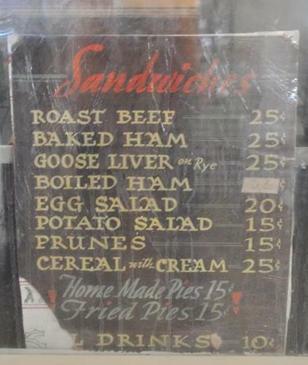 I think it was sort of a cafeteria style back then. 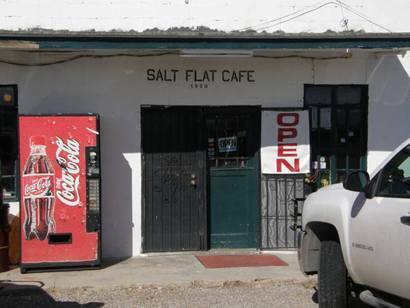 We had been home for a few days and were returning to camp and back to our jobs and we would always stop at Salt Flats and have apple pie and coffee. On this trip JB and his sister Vera had brought along their (Getair) and Mandolin, and they played on and on and on, everyone would holler one more time. Pilipino Baby. To get to the place where we camped we would turn north just east of the Salt Flat Cafe and down a cow trail road through I think seven gates, I know I got smarter as I would always try to set in the middle so I wouldn't have to open those gates, I was just a boy at the time, my job was burning the brush that my dad and uncle raked up into big piles. With a big rake they had invented and welded with our little farm welder and hauled all the way over to Salt Flat on a bob tail truck. The first crop that was planted was Alfa, it didn't turn out very well because they had the land in borders, and were going to use flood irrigation like they use to do over in the Hondo valley, well the water wouldn't flow the way it was supposed to and Mr. Stone, the big boss decided to level it after it had been planted so all of the Alfa ended up at one end of the field. The thing I remember most is how that dirt would make my hair stand straight up and my mom would say I looked like I had been plugged into a light socket, I was 14 years at the time. I worked through the summer and up into the fall then had to go back home and go to school, we were always late getting into school as we would have to pull cotton to pay for shoes and a coat to wear to school, that was the good old days. There was a government trapper working that area back then and he would stop by our camp every time he was in that area and I would get to go with him and help him run his trap line. Coyotes and Bob cats was what he would catch most of the time. When the rabbits ate up the cotton I'm sure there were folks that would have liked to have had the Coyotes and Bob cats back. Dad and I, along with my wife and son and my mother drove over to Dell City in 1958 just to see the town and to look around some and we felt kind proud that we had a little part in making that happen, we were the first ones to acutely start the farms. They pumped the first water into reservoirs and that was part of my job at times to watch for Gopher holes in the dam's, it would wash out in a short time and no way you could stop it once it got ahead of you and that shovel.